Last night set a high standard for the Trinity Arts Festival. 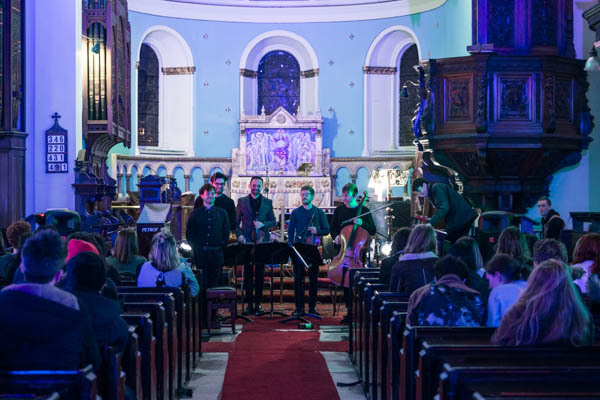 After gathering at the campanile at 7pm, a group of students clad in Trinity Arts Festival (TAF) t-shirts made their way over to the Pepper Canister Church for the opening night of the festival. The evening boasted a free gig to get people in the mood for what is set to be an excellent week ahead. Glasshouse, Meat Clown and Dowry were the three acts that filled the nave of the Pepper Canister Church. 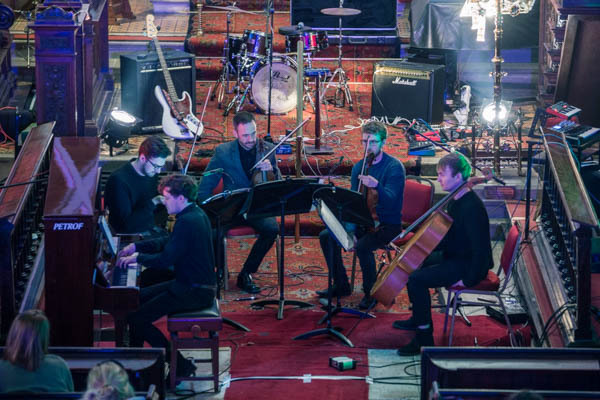 These were some of Dublin’s most prominent up and coming ensembles, and the ethereal surroundings of the Church were amplified by colourful lighting and lilting melodies. The first act to play was Glasshouse and their heavenly harmonies of keys, strings and electronics rang out from the base of the altar. Particularly noteworthy were the songs from the Icelandic composer Ólafur Arnalds, a personal favourite being from his ambient album, and They Have Escaped the Weight of Darkness. A fitting choice to suit the pews full of library escapees. The Trinity Arts Festival launch last night in Pepper Canister Church. The second act to take to the stage was Meat Clown – with the addition of vocals and a strong bass and drums they opened with their own rendition of Hozier’s “Take me to Church”; a song very suited to its surroundings. They continued with “Annie” and progressed onto a song which may or may not have been, in the band’s own words, “a lovely song”. Meat Clown certainly left an impression. The final act consisted of the exquisite Éna Brennan, also known as Dowry. The multi-talented one woman band combined guitar, violin and voice. She wound the night down with her haunting layering of vocals over strings. Her work “Ophelia”, dedicated to the recent storm, was a song that stuck out. Also included in her repertoire was a song that gave the middle finger to Trump. With the successful opening coming to a close, TAF have set the standard high for the upcoming week.